iHome’s iBTB2 Aquio Speaker Bottle wins CES Best of Innovation Award — Live. Life. Loud. RAHWAY, N.J. - iHome, the leader in award-winning speakers, portable devices and smart home control solutions, has been named a CES® 2019 Best of Innovation Awards Honoree for the iBTB2 Aquio Bluetooth Waterproof Removable Speaker Bottle and named a CES® 2019 Innovation Awards Honoree for the iBT621 Portable Color Changing Waterproof Speaker and iCVA66 Alexa Voice Assistant-Enabled Bluetooth Vanity Mirror. The Aquio (iBTB2), available now for $59.99, is BPA-free and manufactured with high-quality, double-wall stainless-steel that keeps drinks ice cold for up to 24 hours or steaming hot for up to 14 hours. Powered by iHome, the modular speaker, with speakerphone capability, is waterproof, sand-proof and weather-resistant. 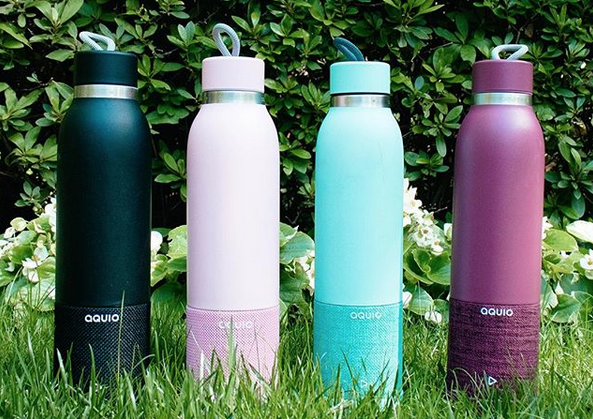 Available in four fashionable colors - midnight, seafoam, merlot and blush. The iBT621, available this spring for $59.99, is a Waterproof Portable Speaker that features 5 LED color-changing modes, wireless music streaming through Bluetooth, audio caller identification and crystal clear speakerphone capability with digital echo canceling — all controllable by Alexa voice Assistant through the Amazon App on connected devices. Finally, the iCVA66, available now for $179.99, is the new flagship model of iHome’s very popular line of high-quality, feature-rich vanity mirrors. The vanity mirror allows users the ability to charge their phones, listen to music, answer calls and use Alexa to play music, set alarms, check calendars or access news, traffic, weather and more. The distortion-free mirror, bright LED illumination, magnification capabilities and high- and low-light settings combined provide the optimal conditions for cosmetic use. iHome’s IBTB2, IBT621 and iCVA66 will be on display in the Innovation Awards Showcase at the upcoming CES 2019. The complete list of CES 2019 Innovation Honorees, including product descriptions and photos, can be found at CES.tech/Innovation. An annual program that celebrates outstanding design, the CES Innovation Awards recognizes honorees across 28 product categories. An elite panel of judges, including designers, engineers and members of the tech media, reviews submissions based on design, functionality, consumer appeal, engineering and how the products compare with competition. Those products recognized as the Best of Innovation honorees received the highest ratings in their respective product categories.